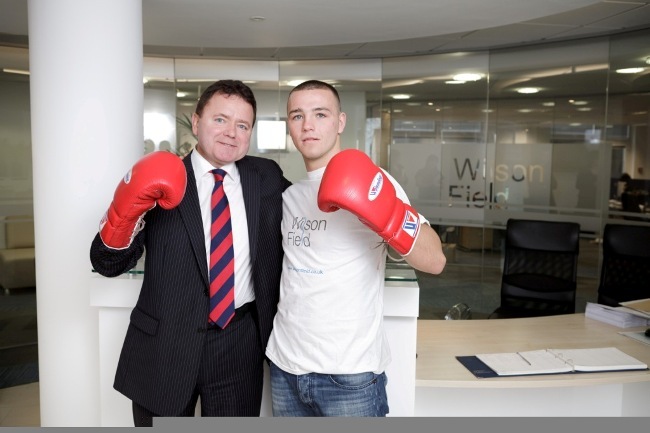 Rising boxing star Adam Etches has stepped into the ring with Sheffield company Wilson Field Ltd which is now his sole sponsor. Adam “The Bomber” Etches, 22, from Birley, is the current IBF Youth Middleweight World Champion and has been sponsored by insolvency and business turnaround specialist Wilson Field since 2010. “It’s great to have a well established Sheffield-based company which is known nationwide behind me. “Adam is a young Sheffielder with a great talent and we are delighted to be his sole sponsor. “The sponsorship is vital, and allows Adam to dedicate 100 per cent to his training schedule as a full-time professional. “It can often be hard for young boxers to remain full-time due to financial difficulties, meaning they have to work as well as train, which is often detrimental to their careers. Adam currently boasts a professional record of 12 wins from 12 fights, registering 10 knockouts in the process, and the sponsorship will go towards Adam’s living, training and travel expenses, enabling him to keep up boxing as a full-time career and fulfil his potential. Wilson Field also has offices in Leeds, Manchester and the West Midlands, with a further five planned to open in 2013.